Police officers stand guard at the roadblock at the entrance to the Los Angeles Police Academy in Los Angeles, California. 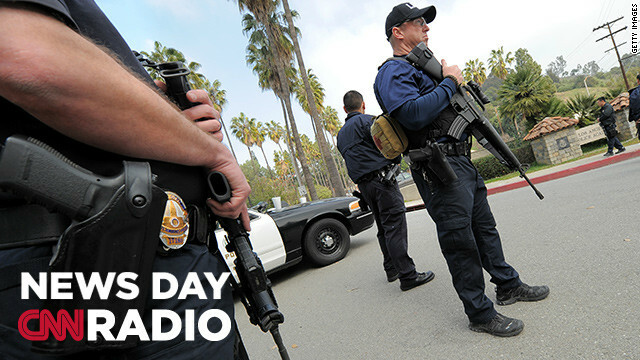 The manhunt continued in Southern California Friday for suspected cop killer Christopher Dorner. The former LAPD officer is accused of killing three people, including two police officers. In an 11 page manifesto posted online, Dorner promised war against the police. CNN's Barbara Hall speaks with Dr. Michael Mantell, a clinical psychologist who worked for several years with the San Diego Police Department. "His pathological narcissism, his sense of being better than anyone else and devaluing others has gone on probably most of his life," says Dorner. John Brennan, the man in line to be the next director of the CIA, had his first confirmation hearing before lawmakers this week. He was grilled about the use of drones to kill terror suspects and said that their use was legal and only a last resort for the administration. But questions remain about the legality and morality of using drones. CNN's Libby Lewis reports on how Brennan has shaped the rules in America's attitudes towards the law of war. "Now that’s a very controversial position, but Brennan has said in an age of unconventional [war] you simply can’t afford to use the same standards as we use in conventional wars," says Daniel Klaidman. He is the author of 'Kill or Capture: The War on Terror and The Soul of the Obama Presidency'. The world has a new prime number. Mathematicians at the University of Central Missouri used 1,000 computers to get this figure which has 17 billion digits. CNN's Barbara Hall speaks with Professor Curtis Cooper who has led the prime search at the university since 1995. He admits the new prime number is of no practical use to anyone right now, but he says that's what people said 100 years ago about primes with hundreds of digits. Today those prime numbers are used to enhance online security for money transactions. "The typical computer might take now about 35 to 40 days to test one number. This is our third one we've found as part of this project," says Cooper.